A few days ago I did something kind of amazing. Something that, if you told me one year ago I would do, I would scoff at the notion. Inconceivable! Impossible! Hogwash! But yet, it happened. I woke up at 5am and ran my first New York City 1/2 Marathon, in below freezing temps, and I lived to tell the story. It’s amazing how running 13.1 miles feels just like a hangover the day after St. Patricks Day. You’re sore, tired and completely dehydrated. After two months of training in the winter cold, I set out to embark on a journey. A torturous, painful journey. And every time I do this I tell myself, never again! Ok…well, maybe. 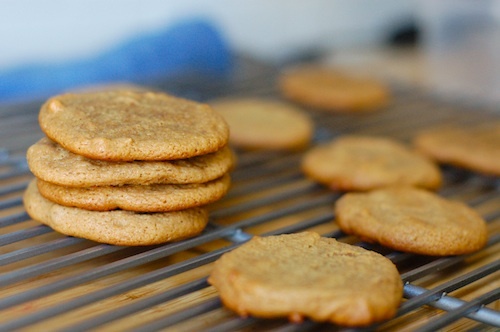 But one thing I do know will happen again, is me baking these delicious grain free peanut butter cookies. Which, by the way are a great source of protein, fiber and carbohydrates for running energy! Boom! 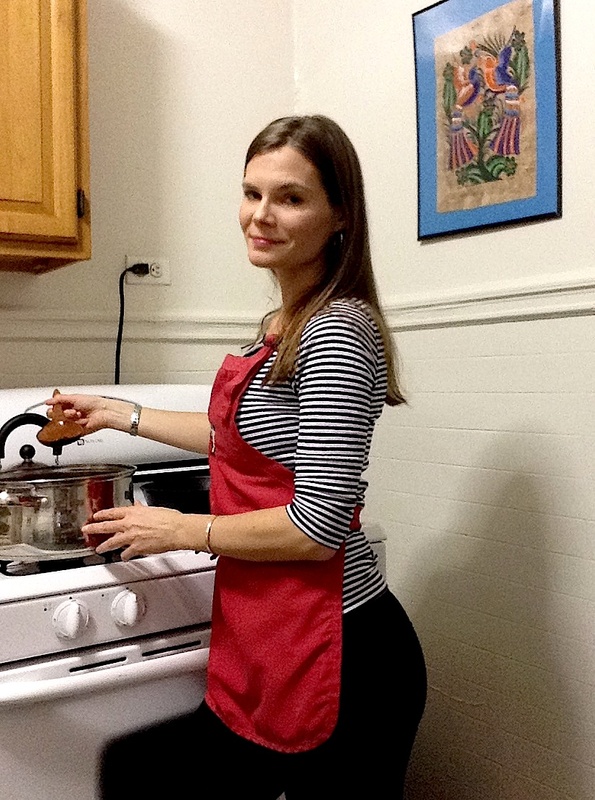 I bake because I enjoy eating. I run because I enjoy eating. These Peanut Butter Chews are super chewy and sweet! Take a few minutes to let them cool on the tray before transferring them to a cooling rack. They may seem fragile at first, but if you leave them out they will become sturdy without becoming stale, one of the many benefits of baking with coconut flour. This recipe makes about two dozen cookies. Preheat oven to 350˚. Line a baking sheet with parchment paper. Mix peanut butter, honey, and eggs together thoroughly. In a separate bowl, whisk together coconut flour and baking soda. Add flour mixture to peanut butter mixture. Once combined, dollop heaping teaspoon sized drops on baking sheet. Allow enough space between cookies, these will spread. Bake for about 9-11 minutes until golden brown. And there you have it. Enjoy! 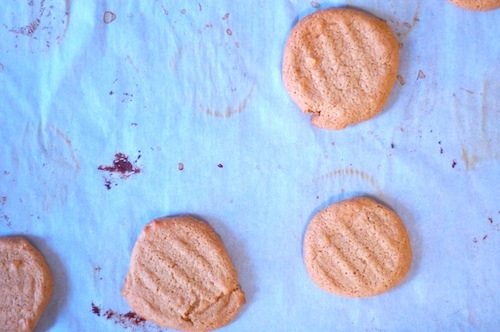 And just for you, here is another recipe for my Chunky Peanut Butter Dollop cookies. These are far more gluttonous, baked with real sugar instead of honey, but still gluten free! Fantastic, my darling! These look great! And again – it was so fun to be there to cheer you on and to get to see you bask in the glory afterwards. I had no idea how inspirational the experience would be! Love you much!! It was so great to share the experience with you and everyone else! Thank you!